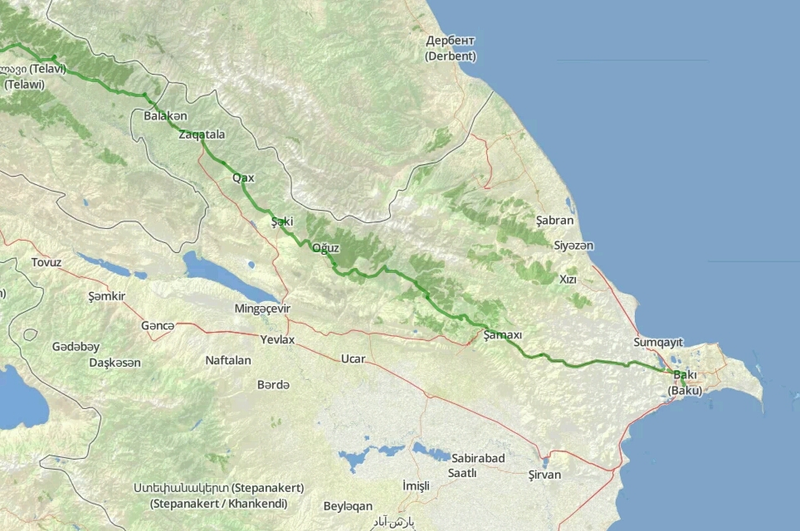 There’s only one direct route from the border at Matsimi to Baku - the highways to the north that skirt the foothills of the Caucasus mountains. Having avoided main roads for the vast majority of the trip so far the busy roads tested our patience a bit, especially past Sheki when we were driven to use our headphones and listen to music to drown out the sound of cars passing. Despite this we managed to soak up the local Azerbaijan culture on many roadside breaks whilst escaping the hot summer sun. Crossing the border it suddenly got very humid and the vegetation changed to more tropical plants and trees. We were grateful for the shady roads, although the humidity was so high that when camping the shade did nothing to stop the sweat pouring off us. One night in particular we both had pools of water on our sleeping mats before we’d even laid down. There were a few too many mosquitoes to sleep outside so we put up with it! Peek-a-boo! Portraits of the President pop up everywhere. In power since 2003 you’d think everyone would know who he is by now! Ilgar helped us complete our registration (mandatory for all tourists who stay in Azerbaijan). It took longer than we hoped as the site only accepts jpg copies of your visa, although the e-visa they issue you is a pdf! We got there in the end and were fuelled on in the afternoon by çay and fruit leather stalls which started to pop up everywhere, It’s fair to say we enjoyed the Azeri tea culture even more than we had in Turkey. The tea here is stronger, served with lemon and comes in a pot for re-fills: tick, tick and tick! 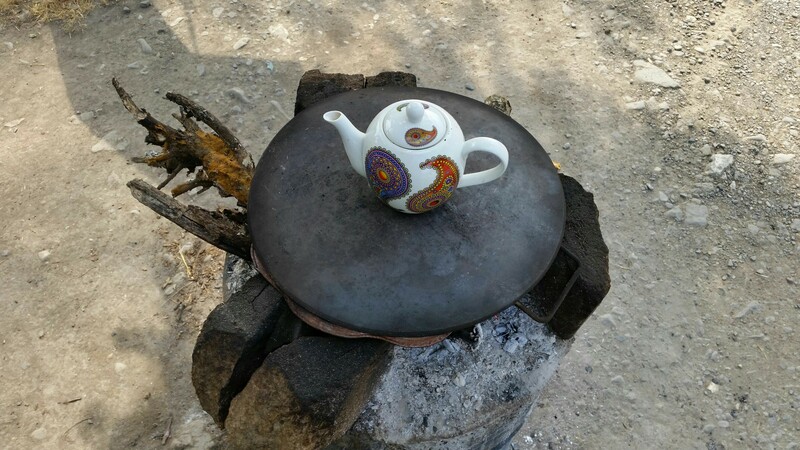 Many of the roadside tea houses are also tucked under trees just off the main road providing the perfect break from traffic and sun. About 100kms out of Baku the landscape changes from forest to desert scrubland pretty quickly. With little cover for camping we asked a local restaurant if we could camp in their garden, which was full of the typical picnic tables and huts. They not only welcomed us with open arms but also bought us tea, watermelon bread and cheese, absolute legends. Only in Azerbaijan would you see a ferris wheel in the middle of semi-desert scrub! Before reaching Baku we were to recieve one last act of kindness, one I will never forget, never be able to repay and will be forever grateful for. 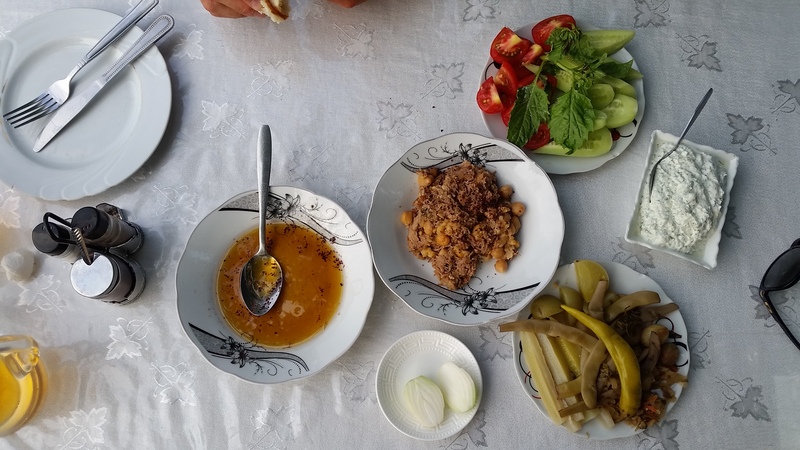 We’d aimed to camp just outside Baku city in order to navigate the busy streets with fresh legs the next day. However as we neared the Lake Ceyranbatan, looking for the best patch of forest to camp in we noticed not just one, but two security fences surrounding the lake, complete with security cameras and lights! Riding around to the gates we asked security if we could camp here or somewhere nearby. There was no way they would let us into the lake compound - it turns out it is a reservoir for Baku’s drinking water and is protected to avoid contamination. This seems a huge shame as it would make a perfect public park, of which there are few until you enter the city centre. Whilst we were going back and forth using google translate with the security officer a group of nearby construction workers came over to see what all the fuss was about. On hearing what we needed Elkan, the lead engineer, told us we could sleep at his place 2kms down the road. He spoke no English so more back and forth with the security guards to make sure we weren’t being sold up the river. Elkan took us in like his children, showed us the shower, gave us his bed, took us for food and showed us around Sumquayit a flashy northern suburb on the Caspian coast. He refused payment, so we left what we could spare, some food and coffee. This experience is just one of many instances where we have been made to feel so welcome in a country so far from home. It is these experiences that really make your trip, teach you about the country you’re in and restore your faith in humanity. Back on the bikes we took the JRQR (Julian Read Quiet Route) into Baku via the back streets, over gas pipelines and down gravel tracks before passing lush green parks and gold studded new apartments. 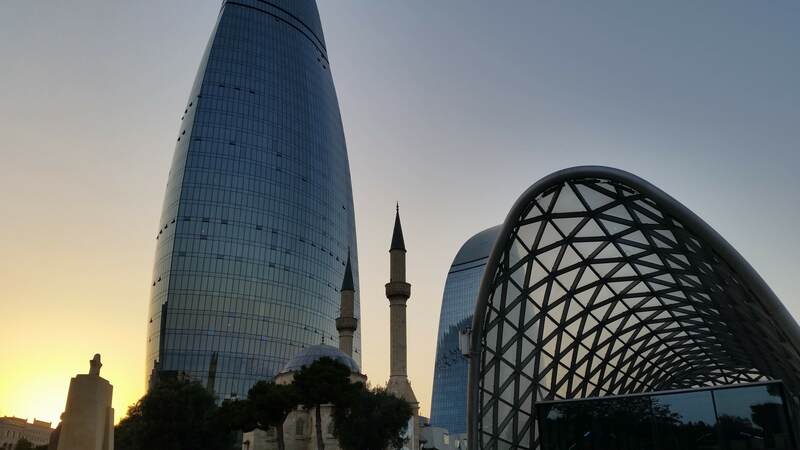 Baku is a burgeoning city, reaping the rewards of the money bought in from the oil fields you can make out on the horizon of the Caspian Sea. Recent inflation is angering some however and their political situation seems even worse than Turkey’s, with the current president in power since 2003, when he was sworn in by his father. We explored the old and new, caught up with other cyclists, found two bike boxes and started packing! After 7440 kms, 4630 miles this is the end of the road for Part 1. The next challenge will be getting the bikes on a plane and back from Heathrow airport, followed swiftly by arranging visas for Part 2 when we will set off east again from Samarkand. Thanks for reading. Any tips, advice, comments welcome!